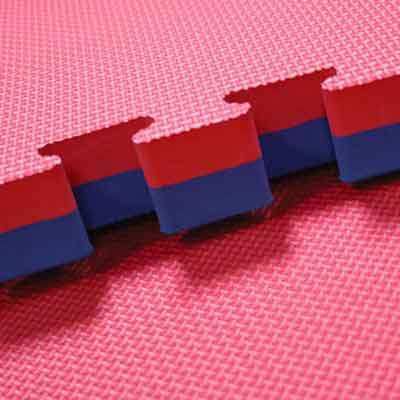 Our Blue / Red 40mm Interlocking Jigsaw Mats are suitable for a variety activities and martial arts including Judo, Jiu Jitsu and Aikido as they offer more protection. Constant training and grappling can often lead to injury if adequate padding is not available during impact. Also other aspects of training like rolling and break-falls require protection to minimise injury. Therefore, the thicker the mat the better the protection. Our 40mm mats are the thickest mats we have on offer. Interlocking 40mm EVA jigsaw gym mats are easy to lay on any floor, area are lightweight, easy to carry and durable. They offer a permanent or temporary cushioned floor solution for comfort and added safety. They are also increasingly popular for home gyms and children’s play areas. We supply our mats to a number of organisations around the country including schools, martial organisations and the police just to name a few. What kind of gym mats do you need? It is not always easy to figure out what kind of mats will suit your training area when ordering exercise mats. There is alway the cost of the mats, the colour and of course the thickness. All of these factors need to be taken into consideration when you order mats for your training area. At Ezymats we are always happy to keep you find a solution. Our aim is always to help the customer achieve absolute 100% satisfaction with there purchase as much as we can. The importance of choosing the right thickness for your mats can never be overstated. Obviously you are buying anti-fatigue mats because you are serious about your training and you want to minimise injury for yourself, your training partners or your students. With this in mind it is important o chose the right thickness. 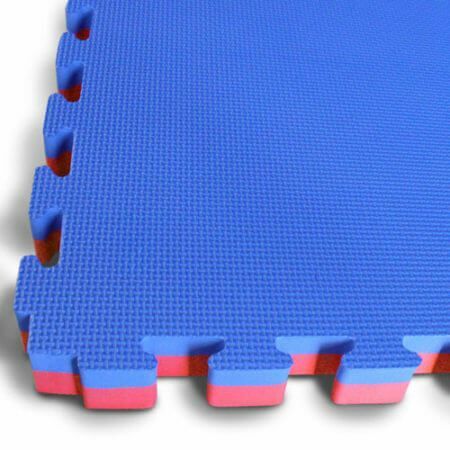 With our range of foam mats the 40mm mat is the thickest that we have on offer. We can arrange thicker mats on special order but these are the thickest we have in stock and they are the most popular for impact sports. They are an great thickness for vigorous activities where you anticipate a larger risk of injury. Whilst no mat is a substitute for safe training a 40mm foam mat will go a long way to helping prevent injury. These blue and red mats are an extremely popular choice when it comes to exercise mats. They are a colour combination that is tried and tested. While the colour is officially red & blue some people refer to them as pink & blue. 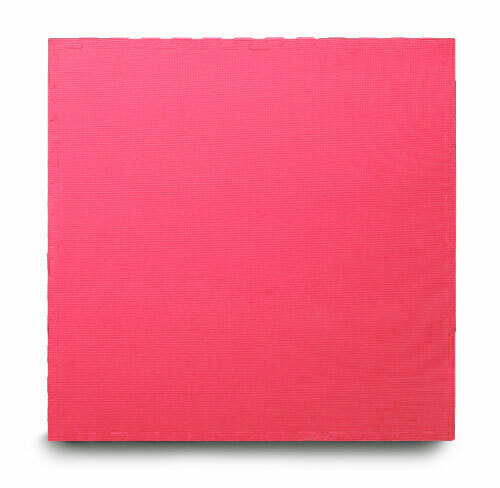 In the sunlight the colour can appear lighter which leads to this effect. The mats are two tone and double sided for your convenience. It is a effective way for you to mark out different area of to have a boarder around your training area so that users know when they are coming close to the edge. These gym mats are interlocking flooring. This make it easy to assemble and means your mats will not pull apart easily. Sometime a smaller area of mats mat move around on a slippery surface but in such instance we recommend just applying some double sided tape or some other non-slip underlay to prevent moving. In instances when it is a larger area or wall to wall there will be no movement. Interlocking flooring like our 40mm red/blue mats is light weight and easy to transport. Ezy Mats is not just a name it is a philosophy. Our mats are not just easy to purchase and assemble. At Ezymats we have a knowledgable and friendly staff that are always will to out of their way to help you find the best solutions for your gym or training area. We delivery Australia-wide and have pickup points from our Sydney and Melbourne warehouses.